We’ve tested 2 Rinnai models to see how they compare to heat pumps. “Heat pumps have smashed us.” So said one former distributor when asked why they got out of the gas heating game. Kiwis have taken to heat pumps like ducks to water. They now warm more than a third of our homes, while the market for gas convectors has stagnated. To find out how they compare to heat pumps, we tested 2 gas convector models from Rinnai — the Energysaver 309FT and Energysaver 559FT. Gas convectors go head to head with heat pumps: they’re a fixed appliance designed to quickly and efficiently warm medium to large rooms and are powered by piped natural gas or LPG. While the market remains competitive for other gas-fired options, such as radiator and ducted central heating and built-in fireplaces, Rinnai is the only brand of flued gas convector heater available in New Zealand. We wanted to see if there was still a place for these heaters, or whether the time had come for them to burn out and fade away. We tested Rinnai’s most popular gas heater, the Energysaver 559FT ($2296, not including flue kit and installation), along with the smaller Energysaver 309FT ($2065, not including flue kit and installation), and compared the results with heat pumps. We assessed the Energysavers in an expanded version of the thermal comfort laboratory we use to test electric heaters — 5m wide by 6m deep and featuring a 2.4m-high insulated ceiling. Both heaters are floor-mounted units. Like heat pumps, these units are costly to shift once installed. We fitted them halfway along a wall. After stabilising the lab’s temperature at 8°C, we cranked the heater’s thermostat to maximum and started timing. Heat-up time: In just over 5 minutes, the 559FT raised the temperature by 5°C, and within half an hour had our lab at a balmy 23°C. This excellent result wasn’t surprising as the 5.3kW unit is designed to heat rooms as large as 77m², and its performance is comparable to a similar-sized heat pump. The 309FT, which has a lower heat output (3.1kW), took almost twice as long to achieve a 5°C temperature rise and only increased the temperature to 16°C after half an hour. Evenness: both gas heaters warmed the room as evenly as a heat pump would, with just over 1°C variation between the warmest and coldest parts of the room. The experience: Heat pumps and gas heaters both warm through convection, using a fan to circulate warm air, rather than by radiating heat directly at you, like a woodburner or bar heater. However, a heat pump can take a while to get going, especially as the outdoor temperature falls (in the same way your car’s heater blows chilly air for the first few minutes on cold mornings). In contrast, the Energysavers instantly produce a jet of hot air. Consumers who are frustrated their heat pumps emit a type of heat that’s too “soft” are likely to prefer the instant, powerful heat of a gas convector. Noise: We measured the sound levels of the Rinnai heaters and found them slightly quieter than heat pumps, though there’s still a perceptible fan noise throughout the room. Rinnai general manager sales and marketing Mark McCutcheon says the majority of customers for its Energysaver heaters “already have piped natural gas and want to maximise the value of their connection”. Note that reticulated (piped) gas is only available in the North Island. The idea is if you’re already paying fixed daily gas charges for powering your water heater and cooktop, you should get your money’s worth by using gas to keep warm as well. 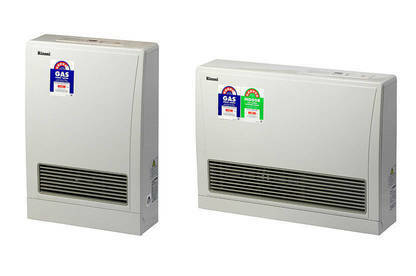 A heat pump with the same capacity as the Rinnais costs about the same to buy and install. And while electricity costs almost 3 times as much as gas, an average of 26¢/kWh vs 8.8¢/kWh, heat pumps convert every unit of power into 3 or more units of warmth. The larger Energysaver 559FT, with an efficiency of 83%, costs 60¢/hour to run from natural gas (based on the North Island average). A heat pump with the same output costs less than 50¢/hour in electricity. So, in economic terms, you’re better off going with the heat pump, even if you’re already paying fixed gas charges. However, in some parts of the North Island, gas is much cheaper than average. In Taranaki, close to our natural gas reserves, prices are the lowest in the country, generally less than 7¢/kWh. This brings the running cost of the Rinnai Energysavers to about the same as a heat pump. Complicating matters, Genesis Energy offers flat rate gas plans where you pay a fixed monthly price for a capped amount of gas per year. If you’re using significantly less than your quota, then it might be worthwhile opting for a gas heater. The Energysaver heaters can also be powered by 45kg LPG cylinders, available throughout the country. Mr McCutcheon says the breakdown of Rinnai gas heater customers is 4 to 1 between natural gas and LPG. Based on the average price of $100 per replacement bottle, the Energysaver heaters cost twice as much to run off LPG as they do from natural gas. Unless you’ve somehow wrangled a very cheap cylinder hook-up, the economics of powering them with LPG are a bit grim. How easy heat pumps are to use is a major drawcard. Push a button on a remote and within minutes your home is cosy. Bells and whistles such as timers and WiFi control further automate the heating process. 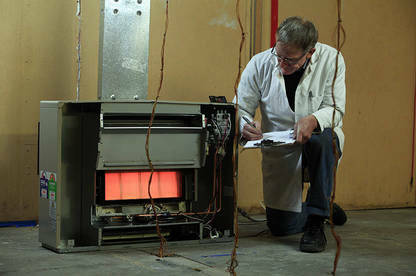 How do gas heaters compare? (Note: the Rinnai Energysaver 559FT and 309FT have the same control panel). Starting: both gas heaters have an instant electronic start we found reliable. Controls: the Energysavers have a push-button digital control panel, allowing you to set the thermostat (16-26°C), select an “economy” mode, activate a child lock or operate the timer. There’s also an indicator light showing when you need to remove and clean the filter. We found the controls easy to understand and use. There’s no remote, so you have to wander over to the heater every time you need to make an adjustment. The electronic controls and starting mechanism mean the heater needs a mains connection, and won’t work in a power cut. Changing the dust filter: The filter is readily accessible from the top of the heater and easy to remove, clean with a vacuum and replace. Timer: The Energysavers feature dual timers. You can set each timer to provide 2 periods of heating each day. Setting the timers is simple. Overall, they’re as easy to use as heat pumps, but the lack of a remote is frustrating. Switched-on users may also want a WiFi control option. Since last year, we’ve observed a 3.8% rise in piped natural gas prices nationwide. Over the same period electricity prices remained steady. Rinnai’s Energysaver heaters should last for upwards of 15 years all going well, but are you betting on the wrong horse if you invest in a gas appliance? New Zealand is self-sufficient for natural gas, with 100% of our reserves produced from onshore or offshore wells in the Taranaki. But a report by the International Energy Agency (IEA) says only about 10 years of domestic consumption “can be covered with current reserves” including the declining Maui gas field. Meanwhile, a study by the Ministry of Business, Innovation and Employment on the future of electricity demand and supply predicts slow growth in demand for electricity. Technological advances like the increasing availability of energy efficient appliances and falling price of solar PV are likely to ease pressure on the grid. New Zealand enjoys a large base of cheap electricity generation sources like hydro and wind power, coupled with what the report describes as an ‘excess supply of committed new generation’. In English, this means some powercos hold resource consents for new geothermal and wind power plants, which they’ll build when they become economically viable. In our view, the only thing you can be sure of is natural gas is more of a gamble than electricity. That said, large increases in natural gas prices in the short term are unlikely. Both Rinnai Energysavers are good heaters: they’re cheap to run, heat up quickly and evenly and are easy to use. As the 559FT has a significantly higher heat output than the 309FT, at a similar upfront cost, we think it’s the better option for homes needing to heat a decent-sized living area. You get cheap per-unit rates for natural gas — about 7¢/kWh before prompt payment, or you’re on a fixed rate plan and aren’t hitting your yearly quota. You have a decent-sized living area to heat (but not larger than 77m²). You want guaranteed instant heat even on the coldest mornings. GUIDE TO THE TABLE = recommended. = worth considering. PRICE is RRP from Rinnai and doesn’t include flue kit or installation, which typically cost $1000 to $1500 combined. OVERALL SCORE Performance (70% based on heat up time and evenness). Overall ease of use (30% based equally on starting, controls, timer and changing filter). TECH INFO Heat up time is time taken to raise temperature by 5°C. Running cost/hour is based on the average natural gas price of 8.8c/kWh and the average price of one LPG bottle of $100, and doesn’t include fixed charges or rental fees. The Rinnai Energysaver gas heaters we tested are flued models, meaning they have a pipe that serves as a chimney for emissions and airborne moisture. Their external temperatures remain low making them much safer than radiant heaters, especially if there are kids around. They also have a child lock for the controls. Overall, they’re as safe as heat pumps. Unflued portable gas heaters are to blame for the reputation of gas heating as a hazardous way to keep warm. They’re dangerous to use unless the room is well-ventilated, as they remove oxygen from the air and can produce carbon monoxide if there’s a fault. Even worse is they fill the air with moisture, contributing to dampness and mould. Don’t buy them. We have an escea gas fire 5 years old. We have constant problems with it costing $1000 in repairs so far this year and has just stopped working again. Is this a common problem with this brand? We haven't come across significant problems with this brand but they could well be troublesome. If you're having constant issues with the product, you may have recourse under the Consumer Guarantees Act. Feel free to call our advice line on 0800 266 786 for more assistance. It's free for members to use. When comparing electricity and gas, surely you should be making a statement on environmental impact as well? Choosing gas means you are consuming a non-renewable resource hydrocarbon pumping carbon dioxide into the atmosphere, a major contributor to climate change. Choosing electricity means you are *mostly* using a renewable resource with much less environmental impact. Sure most people know this, but is seems almost derelict in an article of this nature for Consumer not to mention it. At times of peak demand, for example on cold winter evenings when you’re more likely to blast your heat pump, much of New Zealand’s extra electricity comes from fossil-fuelled power stations. For example, the coal- and gas-fired Huntly station or the Stratford gas station in the Taranaki. While most of our baseload generation is provided by renewable generation sources like hydro power, we still rely on fast-starting fossil-fuel powered plants to meet the peak demand. Heat pumps are more likely to contribute to peak rather than baseline demand, so I thought it would have been slightly misleading to say that heat pumps are the clean and green option compared to natural gas heaters. That said, in the long run you are correct. As we approach a 100% renewable grid based on wind, geothermal and hydro generation, along with distributed generation like rooftop solar PV, heat pumps will become a much more environmentally-friendly option than gas heaters. Unfortunately, it’s looking unlikely that we’ll hit the government’s target of 90% renewable generation by 2025. The big generators hold resource consents for the renewable energy schemes necessary to hit this target, but many of those projects are not yet economically viable so construction is a way off yet. George is right, gas and coal are the marginal fuels at peak times in winter. Not only that, but gas used to generate electricity has an efficiency of 30% to 60% depending on the plant and you'll lose another 10% in transmission losses at peak times - compared with 80-90% efficiency when using gas directly. Bottom line is that the environmental statement should be that using gas for heating at home is BETTER than using a heat pump at such times.